“The town wants what?” Believe it or not, you can’t just put up a sign by yourself without a permit from the town’s government. Each city and town require permissions and fees for your business to put up a sign. Different cities and towns have their own regulations, laws, and applications for business signs. Are you opening your new business soon? Is the lengthy process of obtaining a permit something you really want to spend time on when you could spend your time focusing on your business? At Dawn’s Sign Tech, we can help you obtain a permit for your sign from start to finish. We helped countless of businesses in North Andover, Andover, Haverhill, Lawrence, Lowell, Beverly, Danvers, and many other areas of the North Shore and Merrimack Valley obtain their permits. By hiring us, you would not have to worry about learning about the laws of your town or dealing with the inspectors from the town government. We also have established relationships with the building inspectors and clerks in towns all around the Merrimack Valley and North Shore in addition to being familiar with the different by-laws and zoning laws. We know how long the process will take or if it is taking too long, we know who to talk to get the job done. Our job is to negotiate on your behalf with the right people with the right technical terms. We have done so much work with the building inspectors in the surrounding towns our insurance is already on file with them. They know our work, our quality, and integrity. But most importantly they know how much insurance we carry. Massachusetts has strict laws regarding sign installation and sign installers. If a company does not have workers comp (proprietors are not required to insure themselves under workers compensation) and something goes wrong, they can go after your worker’s compensation. Most business owners are not aware of this or the risk they take by letting underinsured trades people on their property. You worked hard and invested a lot of money to build your business. Would you risk it all to save a few bucks because you let the wrong people on your property? Contact sign permitting professional, Dawn’s Sign Tech to let us make it easy for you to obtain a permit for your business. Our extensive experience and knowledge can assist you to get noticed easily while helping you obtaining a permit from building inspectors. We handle sign permits, temporary permits, zoning board of appeals, design review, historical commission, police details, permits to block the sidewalk, and more. Soiree: it may not look much different with the before and after. But it was the same sign, taken down, repainted and a new layout for the same business. It still had to go through design review and get a new permit. 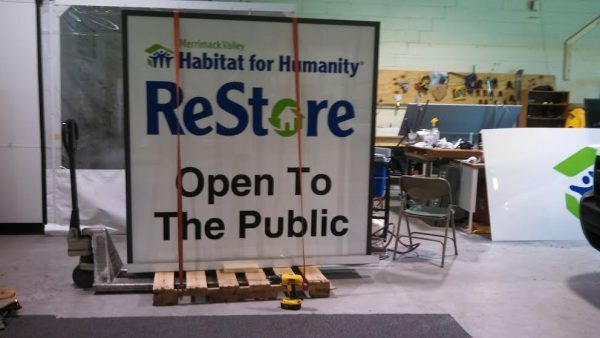 Habitat for Humanity ReStore: even charities and non-profits are not immune from permits and red tape.